Union Minister of State for Shipping and Telcom Milind Deora and senior BJP leader Kirit Somaiya today filed their nomination papers for the upcoming Lok Sabha elections. 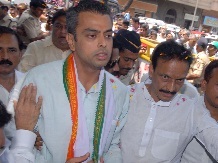 Deora is seeking a third term from Mumbai South parliamentary constituency while Somaiya, who earlier represented the Mumbai North East seat, is the BJP candidate in fray and will try to wrest the seat back from NCP. Bala Nandgaonkar of MNS, who finished second in the 2009 polls against Deora, also filed his papers.